Many people don't realize this, but NYC is a destination elopement city. There is no residency requirement, no blood test needed, and there is only a 24 hour waiting period. It is very easy and very cheap to get legally married here. You can either get married at City Hall, or you can hire an officiant and get married in most public parks in the city. *It's not actually City Hall. It's technically the City Clerk or Manhattan Marriage Bureau, but most people still refer to it as a "City Hall Wedding." Regardless of the name, it's a civil ceremony, and you'll be legally married once it happens. Apply for a marriage licence. You can do it right here via City Clerk Online. You will get a confirmation number once you complete it online. You can also apply in person (see the next step for details). Bring your confirmation number to the City Clerk, located at 141 Worth St, Manhattan, to finish applying for your marriage licence. The office is open Monday - Friday 8:30am - 3:45pm. Both partners will need to be there in person, and you'll need to both have a government-issued photo ID. There is a long security check to get into the building, so expect to wait in line. Once inside, you'll go to the yellow information desk, and they'll help you complete the application. It's a $35 fee, and they only accept money order or credit card, no cash or checks. Once you have your marriage licence, it's valid for 60 days. There is a 24 hour waiting period before you can get married. After the waiting period is over, you can go back to the City Clerk's office. To have the City Clerk's office perform a marriage ceremony, you'll go through security again, and go back to the information desk just inside the building. Bring your marriage licence, your IDs, and a witness with an ID (I am happy to be that person if need). The fee is $25, payable by money order or credit card. Once you and your witness sign your licence and pay the fee, you'll go to a chapel for a 60-90 second ceremony. They allow you to exchange rings, but they do not allow you to personalize the ceremony or your vows. (There's a lovely spot just outside the building if you'd like to do any readings or say personal vows once the legal ceremony is complete.) 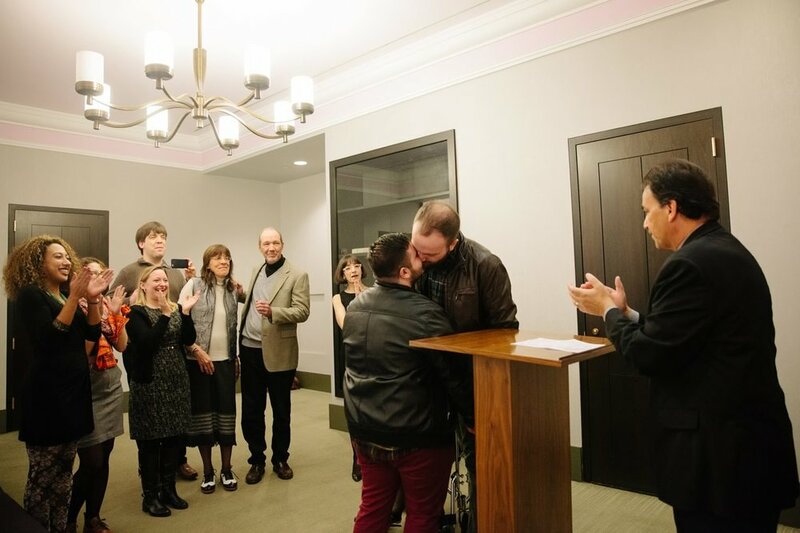 The clerk will pronounce you legally married, you'll kiss, and they'll give you a marriage certificate! Your certificate will be filed with the state automatically, and you can use the certificate in any legal instances right away. You can also choose to be married in NYC in a more personal ceremony. This lets you pick a location, say your own vows, and avoid the lines and wait times that go with a city hall wedding. To do this, you will need a marriage licence (see steps 1-3 above). You need a registered officiant. It is pretty simple to become an officiant, and many people have a friend do this for them. If expediency is your goal, I suggest hiring someone who is already registered and very familiar with the legal process. It is the officiant's job to make sure your marriage certificate is properly filed with the state after the wedding, so it's a good idea to use someone who isn't learning how this works as they go. If you'd like a list of lgbt-friendly officiants to contact, just email me. I'm happy to help. You'll need a witness to sign the license, just like at City Hall. You can actually have 2 signatures on the license in this case, if you have specific people you'd like to include. You need a location. You can get married anywhere in Central Park, except the Central Park Conservatory Gardens, for free, without a permit. The only rule is that you must have less than 20 guests and your photographer can't use a tripod or other stationary equipment. If you want the ability to ask someone to move to give you privacy, or you will have more than 20 guests, a permit is required. You can get one here. It's a $25 non-refundable fee, and you have to request it more than 30 business days in advance. The same rules apply for many other public parks, including City Hall Park, just down the street from City Hall. You can view the permit information here. That's it! Whichever option you chose, you don't have to spend the amount of money you'd spend on a big wedding to be legally married. You have to deal with some bureaucracy, but for the most part, it's quick, easy, and cheap. If this is something you want, and you'd also like to have your wedding day documented, please, email me for more info. If you want guidance on how or where to easily get married in New York City, or recommendations for officiants who believe love is love is love is love, please reach out. I will happily photograph your wedding in Jersey City, Hoboken, or NYC.